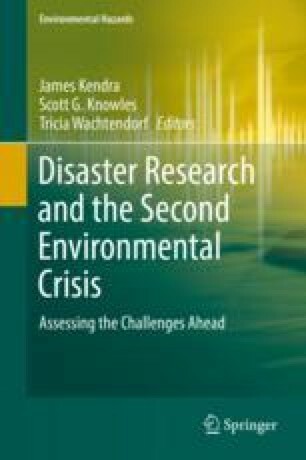 This chapter describes the historical context within which the Disaster Research Center at The Ohio State University began in 1963, both what came before and major issues confronted during the early years. Future directions in disaster research are then described. Key areas for the future research agenda include both basic theoretical issues and specific areas of inquiry reflecting paradigm shifts and emergent cultural and social changes. Revision and expansion of the opening statement at the Disaster Research Center’s 50th Anniversary Workshop and Celebration, University of Delaware, Clayton Hall, Newark, Delaware May, 2014. I wish to thank Ruth Ann Drabek for her work on this paper. Partial support was provided by the University of Denver through the John Evans Professorship program. Any opinions, findings, conclusions or recommendations expressed in this paper are those of the author and do not necessarily reflect the views of the University of Denver.